Members of the Finance Association (FA) pose in the Mihaylo College Courtyard. Among the club’s objectives is connecting students with the finance professional community. “We bring in a lot of alumni, who are seeking talent from Cal State Fullerton. Some will help students get jobs or internships,” he says. Seeking a career in finance? Cal State Fullerton’s Finance Association (FA) provides networking opportunities, insider perspectives on various subsets of the field and personal leadership development opportunities. The club’s president, Jeremiah Ho ’18 (risk management-insurance) discusses opportunities with the club. From risk management to investment banking to personal financial planning, the finance industry provides a number of lucrative and versatile career paths for today’s young professionals. 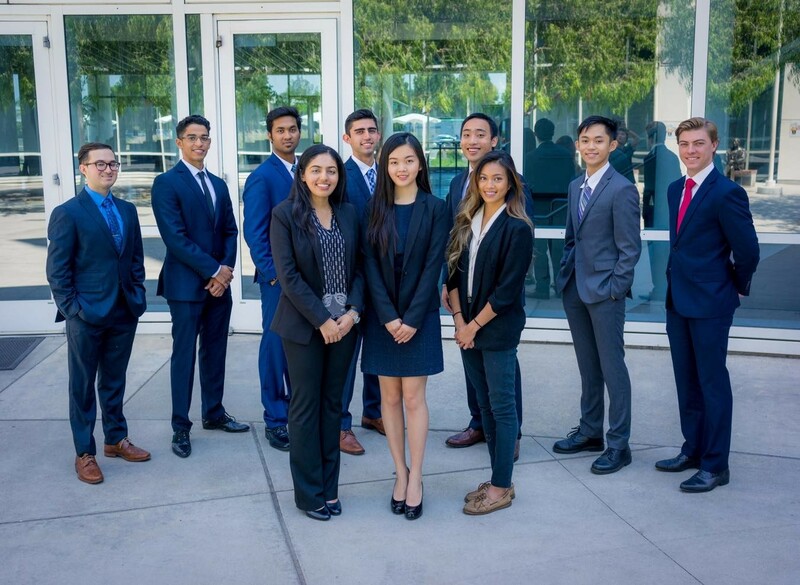 Cal State Fullerton students of all majors have the opportunity to connect with this industry and explore what roles best suit their objectives through the Finance Association (FA). We connect students with financial professionals who will help them determine what they want to do after graduation and connect them with resources that will get them internships and full-time jobs. The practical impact of the FA is visible in the focus on career connections. Networking opportunities occur numerous times each academic year. For instance, so far this year, the club has hosted speakers from companies such as Snapchat, Deloitte and Merrill Lynch at their events. The vice president of finance for the LA Dodgers is coming this November. “We bring in a lot of alumni, who are seeking talent from Cal State Fullerton. Some will help students get jobs or internships,” says club President Jeremiah Ho ’18. Each opportunity provides unique benefits and perspectives, which Ho believes represents the importance of embracing multiple career experiences. While the aspirations of FA members vary greatly, investment banking and financial analyst roles are two of the most popular. Ho’s team has been instrumental in bringing in more financial analyst speakers, much to the delight of members. 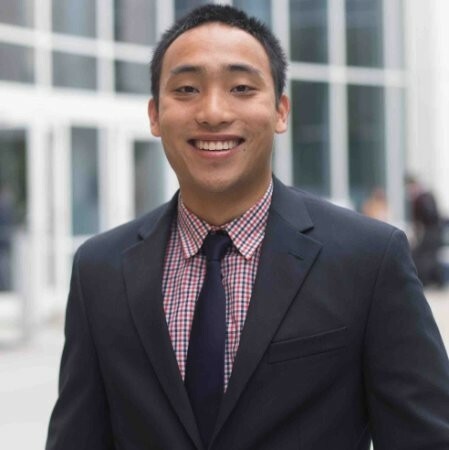 For FA President Jeremiah Ho ’18, involvement in the club has paid incalculable professional and personal dividends, including internship and job connections, friendships and leadership opportunities. He hopes other students will experience similar growth by being a part of the club. For Ho, involvement in FA, which began in his junior year, has been at the heart of his Mihaylo College student experience. In addition to developing lasting friendships through the leadership roles he has held, Ho also identified risk management and insurance as his preferred career path, secured two internships and developed his leadership abilities. “When I first joined FA, I was a transfer student who had no idea what to do with his degree. FA is more than a calendar of career-focused events and speaker visits. Under Ho’s leadership, the club has also prioritized social and team-building events, as well as practical opportunities to hone finance skills. For instance, FA joined forces with several accounting clubs to handle the bookkeeping and financial end of the Fullerton Arboretum’s Plant Sale in March. Students kept accounts for the more than $30,000 raised at the event while making connections with students in other clubs and gaining verifiable experience for their futures. This semester in particular is filled with fun social events. The club has planned a fun night at Boomers, with activities such as laser tag, go-karting and rock climbing. They are also volunteering for two Saturdays at Poochmatch, a puppy charity in Yorba Linda, where they will play, walk and showcase the puppies before adoption. 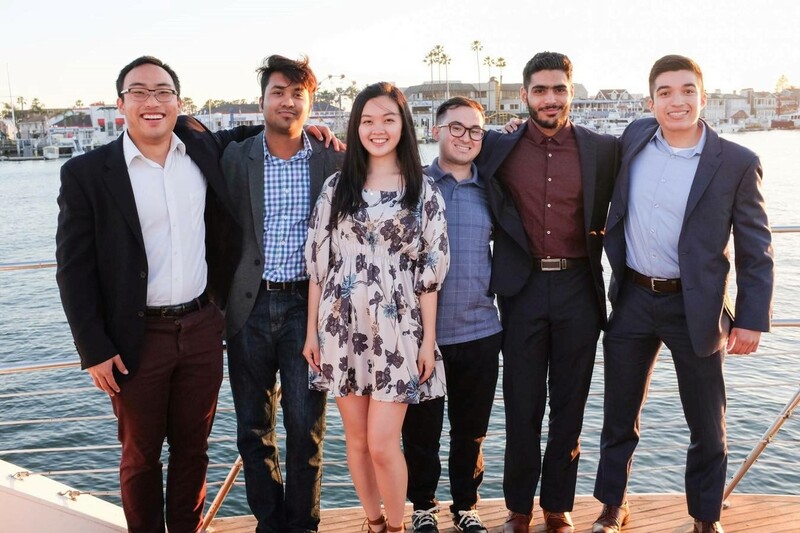 Events, such as this yearend banquet on a yacht, help FA members build a bond with their fellow Titans. Interested in engaging with FA? Join the club at one of their events that are open to the entire university community. On Thursday, Oct. 11, the club will be co-hosting financial professionals from the Walt Disney Company. The event will be held at Langsdorf Hall (LH 320) at 4 p.m.
To maximize these experiences, Ho encourages students to engage with guest speakers. “When the speakers come, ask them questions and afterwards come and talk with them. Most importantly, distinguish yourself by sending a follow-up email, because 99% of students don’t do that,” he says. Among the FA board positions are vice president, corporate relations, volunteer coordination, treasurer, operations, BICC representative, communications and marketing. To join, please send an email to mihaylo.finance@gmail.com, providing your name, email address, graduation year and whether you are seeking a semester or full-year membership. You can also join by direct message on the club’s official Facebook page. For finance alumni and other professionals in the field seeking to engage with CSUF talent through FA, get in touch through mihaylo.finance@gmail.com.